The cars I have owned (or co-owned) over the years. I'm not counting vehicles that were driven mainly by others/family cars. 1974 Plymouth Duster, 2 door coupe. I owned this with my brother Rich. It was pea green, but one of the front fenders was rusted out so we replaced it with an used part...that happened to be orange. I eventually handed over my interest in the car to my brother. I think about a year later the engine blew. 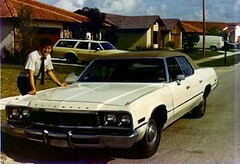 1974 Plymouth Fury III, 4 door sedan. This was probably my favorite car, ever. 360 cubic inch engine. Very fast and very comfortable. It was tan with dark brown vinyl tap. I ended up totaling it while driving on route 307 during a snowstorm (I was picking up my mother from where she worked). 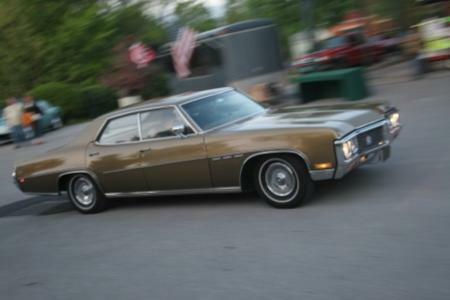 1970 Buick LeSabre, 4 door sedan. It was black and bore a resemblance to the batmobile. I sold it after about a year or two. 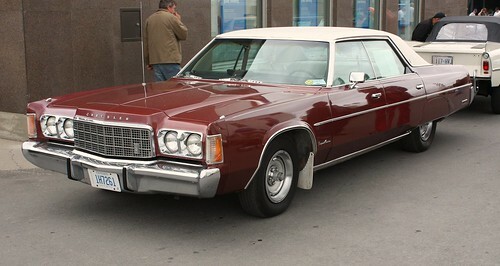 1974 Chrysler Newport Custom, 4 door sedan. This was the car I took away to college for my junior and senior years. It was enormous. How big? Well I've stayed in hotel rooms with less interior space. 440 cubic inch engine got about 10 miles to the gallon city. I didn't drive down the road in it...I floated down the road. The transmission eventually went bad...and this is the gospel truth...while driving home for the last time from college. 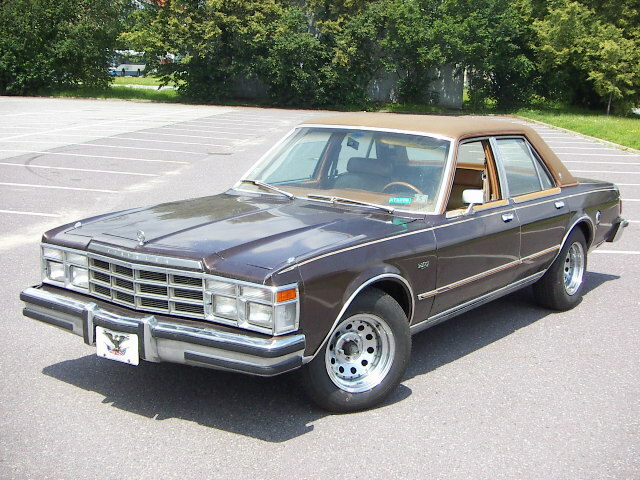 1978 Chrysler LeBaron, 4 door sedan. This was a great car, but it had one flaw: whenever it rained the floor behind the drivers seat would flood. I kid you not. I checked and it wasn't rotted under there, so who knows where the water came from. The car was totaled in York PA while I was driving back from work by a guy who ran a stop sign. 1980 Dodge Colt, 2 door coup. It looked just like the picture in the link. This was a great car and I put a ton of miles on it. I had this car while I worked for the Bon Ton. Traveling between the Bon Ton in Carlisle and Perry County I went through something like four sets of front brakes. The transmission eventually died at about 160,000 miles or so in mid-1989 as I was just starting with my present employer in Florham Park, NJ. 1974 Mercury Comet, 4 door sedan. I was actually given this car by my brother Chris, as I needed something to drive (the Colt had died) while in NJ and I couldn't afford another car. This was a wretched piece of crap that wasn't worth the "free" price I paid for it. The steering was bad. It leaked exhaust gas into the cabin. It creaked like an 85 year old man. One day I just drove it to the junk yard and said "take it". 1986 Chevy Celebrity, 4 door sedan. A stop-gap car between the Comet and my next vehicle. I had this for about a year or so. Outside of a set of front brakes and a thermostat, this was a pretty good car. I traded it in for the truck. 1997 Ford Ranger, extended cab pickup truck. I loved the Ranger. It's only real flaw was that it was rear-wheel drive, making it a a horrible drive in snow. That noted, I loved the utility of the vehicle. I bought it in 1998 and it only had a few miles on it. I think I gave it to my oldest daughter when it had about 80,000 miles or so on the odometer, after having owned it for almost a decade. I eventually traded it in for a more suitable female college student vehicle, a 1999 Chevy Cavalier 2 door coupe. I'd love to get another truck one day, although it would have to be 4 wheel drive (or two wheel drive but as a second vehicle to something with front or AW drive). The Ranger is probably still tooling about somewhere. 2005 Chrysler PT Cruiser. I actually had the truck and the Cruiser together for a short period of time. I bought the Cruiser in 2006 with about 15,000 miles on it and just recently gave it to my oldest daughter. It's a great car that was small but drove like it was much larger. My only complaint was that it started to run into mechanical problems at about 70,000 miles (two oil leaks, A/C compressor that went). I want my oldest to trade it in when she graduates next Spring. 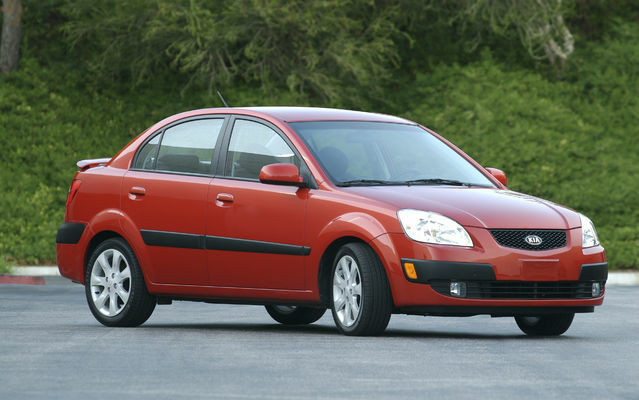 2009 Kia Rio, 4 door sedan. My current vehicle. I got this in May from Scranton Toyota, and it had about 10,000 miles on the odometer. I've had a few minor problems, but all have been fixed by the local Kia dealer. The Rio is great on gas, which is what I was mainly looking for in a car these days. I'm probably going to hang on to this and eventually give it to one of my daughters.